It's more than a month to Christmas but people are already starting to talk about year-end parties and holiday presents. November and December are when people let their hair down - and loosen their purse strings. Unfortunately, many young adults don't seem to have budgets for their year-end spending. So they may not keep track of how much they splurge, only to regret it all in January when sanity returns. The first thing that we should remember, of course, is to keep to our savings plans even when the Yuletide songs start playing and the stores start advertising their year-end sales. The second thing is to pick ourselves up and forgive ourselves quickly even if we make any mistake and splurge excessively on unnecessary items. Only when we allow ourselves fresh starts will we be able to think clearly and make right decisions again. I recently had to give myself a fresh start too, after a spending setback. It all started last month when I bought a new laptop for around $1,900. It was something that I had to shell out money for - my old one decided one day to throw a fit and stop working, so I had little option but to dip into my savings. It was what happened afterwards that was more regrettable. With my heart aching and mind buzzing from the setback to my savings plan, I lost control of my financial discipline and unwittingly spent even more. It was just like dieters stuffing their faces with junk food after the setback of eating one unauthorised brownie. In my case, I gave up on my financial "diet". My backsliding started right at the shop where I bought the laptop. There was the $30 I shelled out to be a member of the tech chain, although I rarely buy electronic products. Then, I realised that new members get to buy a portable cellphone charger at a steep discount. Ka-ching! I forked out about $40 for that as well - despite having bought a similar charger just a few months before. After suffering a $1,900 setback to my savings plan, $30 or $40 seemed like small change - although I typically try to keep my daily budget to under $35. I'd been swearing off taxis, given the toll that the fares take on my wallet - but I promptly returned to them, travelling by cab even to work. That's $6, rather than the 83 cents it would cost if I took the bus, and this daily expenditure adds up quickly. Plus my trips on weekends would cost $15 or more each way. Even my food choices became more expensive. Though I typically avoid bubble tea as it is pricey and unhealthy, I started drinking more of it. Those indulgences cost $2 to $5 per cup - pouring money down the drain, when you consider that a $7 bottle of Ribena blackcurrant cordial can make litres and last me for a month. Generally, there just seemed to be more stuff to buy, from the $5 bag of imported potato chips to the $4 chicken pie from an upscale shop that would have cost much less elsewhere. I still recorded all these purchases with the expense tracking app on my phone - but somehow it no longer had any effect on me, when it would previously act as a check on the impulse to spend. I had faithfully put in the $1,900 laptop cost and looking at the huge sum at the top was totally demoralising. "What's the point?" I thought. "There's no way to average down and fit under the $35 daily budget anyway." The records showed me busting my budget by about $250 for the next two weeks. The sad thing is that I can't really remember anything of note that I bought with that money, meaning it was all wasted. So rather than being constantly demoralised by this comprehensive derailing of my savings plan, I decided to give myself a fresh start by deleting all my records to take myself back to zero. My morale was lifted immediately. Given a fresh slate, I once again felt the adrenaline rush from the challenge of trying to keep my daily budgets to below $35. This was a challenge I had relished before - I used to love seeing how little I could spend and, by extension, how much I could save. With this fresh start, I'm back at it again. Although I'll never again see the $250 I blew on worthless purchases, at least I'm back on the right track now. 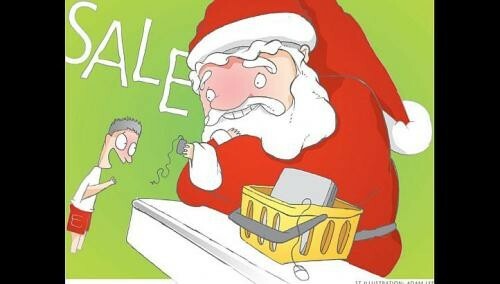 In the upcoming holiday season, I hope that people will refrain from making outsized purchases that they regret later. But even if they do, they should learn the lessons, dust themselves off, and give themselves a fresh start. It's the first step on the long road towards getting things back in order.